There is a vast range of causes for which you might want to raise funds. Many people have a sense that they want to do something to help, but are unsure of how to go about it. 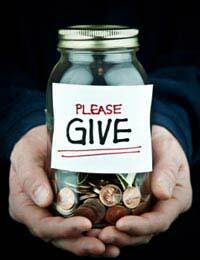 Fundraising can be daunting, particularly if you are doing it for the first time. So here are our top tips to help get you started. Fundraising requires confidence. You will need to approach people you have not met before, and you will need to speak convincingly about your cause. If you feel uneasy approaching people out of the blue, consider putting together a few points to help you remember what you need to say. Try it out on your friends or family first. Although confidence is important, there is nothing more likely to turn off potential donors than a pushy fundraiser. Make sure that you do not appear cocky or put too much pressure on the people you approach. Setting a target is one of the most effective ways of improving your fundraising performance. Set the target early on – but remember to be realistic. An unachievable goal will become demoralising pretty quickly. A scattergun approach to fundraising rarely works. Instead, you should formulate a proper strategy for your efforts. Think about your potential donors. What are the tactics that are most likely to secure donations from them? How do they spend their time? What are their interests? By considering these factors you can develop the tools you need to secure the highest possible levels of donations. Remember that your ultimate goal is to raise as much money as possible – so don’t spend cash unnecessarily. Think about ways you can operate cheaply. Businesses and individuals will often give discounts or do things for free when they know it is for charity. Given the sheer number of fundraisers and causes in the UK, it is important that you stand out from the crowd. Think of unique, eye-catching ideas that people will talk about. These are likely to be the most effective fundraising methods. Potential donors will want to talk to you about your cause, and understand what you are trying to achieve. Make sure that you are easily contactable and always approachable in order to make this as easy and natural as possible for them. You should be prepared to share a range of information with potential donors. People are often understandably cautious about donating to charities, but by being open about what you are trying to achieve you can help to put their minds at ease. Businesses are often keen to help out employees who are trying to raise money for charity. Ask your employer if they might be able to lend a hand – even if that just means leaving a collection tin out in the office. The most important thing is action. Many people are overwhelmed by the work involved in fundraising – but as soon as you get started you will realise it isn’t all that daunting. There is a range of advice for fundraisers elsewhere on this site, all of which is applicable to fundraisers at every level of experience. Good luck! I am very happy to read the information provided as I am raising money for the cause of the FLOOD AND CYCLONE DISASTERFARMERS AND VICTIMS IN INDIA and I wish to raise donation funds soon.THANK YOU .